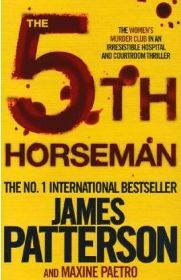 The 5th Horseman, written by James Patterson (with Maxine Paetro) is the fifth in his series of ‘women’s murder club’ novels. Each book has a numerical theme in the title (1st to Die, 2nd Degree, etc), so the title of this one – ‘The 5th Horseman‘ – follows the same theme. I have to admit though, that I was not absolutely sure of the relevance of the title until right at the end of the book when all becomes clear! The same main characters appear in all five books, but even though there are some references to earlier storylines, you do not need to have read the previous books in order to enjoy and follow ‘The 5th Horseman‘. The Women’s Murder Club consists of four women – Lindsay, a police lieutenant; Yuki, a lawyer; Claire, a medical examiner and Cindy, a newspaper journalist. As in all the previous novels, they end up involved in a criminal investigation which Lindsay is working on. In this book, Lindsay is trying to find the killers who are murdering young girls, dressing them up in posh clothes and abandoning the bodies in smart top of the range cars. At the same time, there is an ongoing court case where a number of bereaved relatives are suing the local hospital for negligence over the sudden deaths of their loved ones. These deaths come to the attention of the women when one of their own relatives ends up in the same hospital with drastic consequences. As time moves on, it seems that what at first was construed as gross negligence is in fact a lot more sinister! All the women work together to find out what is actually going on at the hospital. I won’t say any more about the actual story line so as not to ruin the plot. What I will say though, is that this is a fast moving, pacy novel with many twists and turns along the way! I’m sure it will keep you guessing right up to the last few pages! The story is really events driven so the characters are not so well developed, although all of the main four are strong, feisty women who relate well to each other. Patterson does provide some small glimpses into their private lives but these are just diversions and are not really relevant to the plot. Lindsay’s love life does provide a little light relief though from the tension of the main plot. Patterson does seem to be the master when it comes to writing about murder and suspense. His crime scenes are realistic (and not too graphic!) and in each book there is something new and unusual about the mode of murder. Because the book is action driven it does make it very pacey, and this is coupled with the fact that he always writes short, punchy chapters which create a momentum for the reader – it is always very easy to read a little more because the chapters are so short! He is also very good at revealing little by little what he wants his reader to know. This seems to be another way he keeps you on the edge of your seat! Also different chapters are written from different points of view – some as Lindsay written in the first person, and when focusing on other characters it is written in the third person. These all allow different snapshots of the action! So overall I really enjoyed this book. It had a good storyline which was not predictable and I wanted to read on to find out what was going to happen next. No Comments on "The 5th Horseman"